The Interpolate Geometry command allows the user to interpolate the 3D river geometry from the defined HEC-RAS cross sections and the elevation terrain DEM contained in the project. This command extends the Interpolate Cross Sections command by interpolating the 3D river geometry between defined cross sections. This functionality is quite useful when the terrain data does not contain any channel geometry. From the defined HEC-RAS cross sections, the software will interpolate the river channel geometry between the defined cross sections, burning the cross-section channel geometry into the 3D terrain data while it follows along the river reach alignment centerline. The Interpolate Geometry dialog box will be displayed. The following sections describe the Interpolate Geometry command as well as how to interact with the above dialog box. This section allows the user to define whether the Interpolate Geometry command should be applied to all river reaches contained within a project, or a specific river reach or portion of a river reach. For example, for a large model with numerous river reaches, this option allows the user to interpolate the river and channel geometry in a small portion of the model. All river reaches (entire HEC-RAS model): This option causes the interpolation to be applied to river reaches within the model. Restricted to river reach: The user can select a specific river reach from the dropdown entries. Alternatively, click the [Pick] button to select the river reach from the Map View. Upstream XS river station: From the dropdown combo box, select the upstream cross section at which to end the river geometry interpolation. Alternatively, click the [Pick] button to select the cross section from the Map View. Downstream XS river station: From the dropdown combo box, select the downstream cross section at which to start the river geometry interpolation. Alternatively, click the [Pick] button to select the cross section from the Map View. Channel and overbanks: Interpolates the river geometry for both the channel and overbank regions. Channel only: Interpolates the river geometry from the channel only. 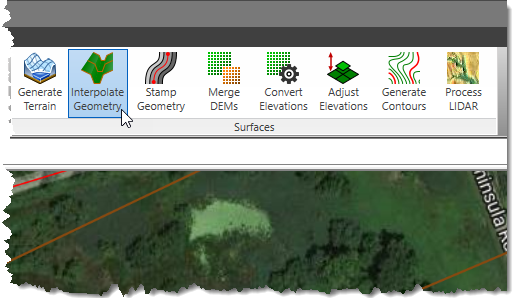 This section allows the user to merge the interpolated river geometry layer with an elevation terrain DEM. The Base terrain grid layer dropdown combo box lists all the elevation layers that are currently used in the project. HEC-RAS model selected extents: This option will create a bounding rectangular region the same size as the HEC-RAS model reaches, cross sections, storage areas and 2D flow areas, plus an additional buffer boundary. User-defined limits: This option allows the user to draw a rectangle on the Map View to define the limits of the river geometry interpolation. Click the [Pick] button to select the limits on the Map View. The dialog box will temporarily disappear, and an information message will be displayed on the status line. Click and drag a rectangular region on the Map View to define the elevation terrain DEM limits. After releasing the mouse button, the user will be returned to the dialog box. A layer will be created with a rectangular box drawn to represent the user-defined selected region. Base terrain grid limits: The interpolated river geometry elevation terrain DEM will have the same extents as the original base terrain grid. If the Merge Terrain Layer with Interpolated River Geometry section is unchecked, then this section will be unavailable (i.e., grayed out). This section is used to specify the interpolated river geometry DEM being created. Click the […] browse button at the River geometry DEM file entry to specify the file name and the directory location to save the interpolated river geometry DEM. If the Load DEM as map layer checkbox option is checked then the interpolated DEM will be loaded as a layer in the Map Data Layers panel. Click the pencil icon to rename the layer. The defined layer name cannot be the same as the existing base terrain grid layer. The River geometry DEM CRS entry is used to select the Coordinate Reference System (CRS) that the interpolated river geometry grid will be created with. This entry only lists the CRS that are used by the different layer data contained within the project and will list the project CRS as the default entry. The Overwriting existing terrain layer checkbox option controls overwriting an existing terrain layer with the same layer name. This section is used to define the terrain quality by specifying the grid cell size of the interpolated river geometry terrain grid being generated. From the Predefined terrain quality entry, choose the resolution option to be used. Elevation grid resolutions range from low to ultra-high quality. Alternatively, from the User-defined cell size entry, the user can manually define the grid cell size. The finer the grid resolution (or smaller the cell size) defined, the greater the detail that can be represented in the interpolated river geometry terrain grid. 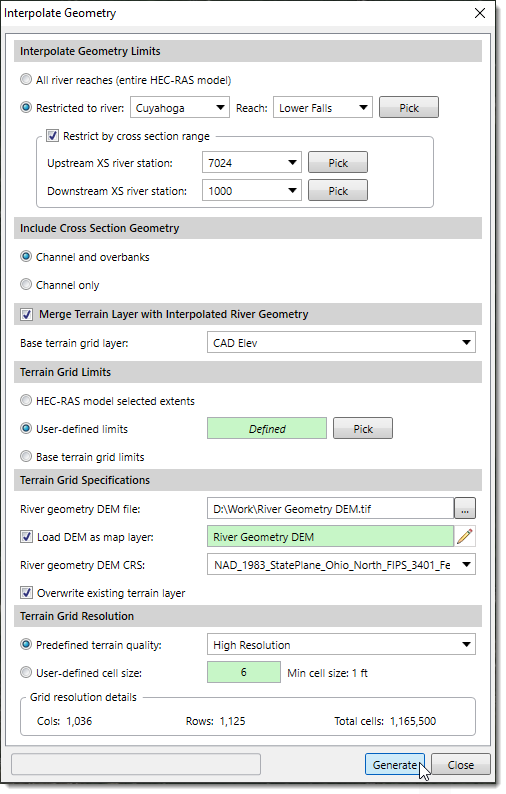 After the river geometry options have been defined, click the [Generate] button and the software will generate the interpolated river geometry grid file and optionally load the DEM as a new layer in the Map Data Layers panel.